All signs pointed to Carr as the next great Trojans back: He tears through the line like the wind. He blocks men twice his size. He does it all. That was before the injury. But he had been through more difficult times. Rehab? Small things to a boss. Now, he’s the man in the USC backfield, ready to claim what’s his. It's a windy, 65-degree November day, chilly for Los Angeles. Students struggle around USC's campus in puffer jackets, scarves and boots. Running back Stephen Carr, then a true freshman, walks into the team's media room in a cardinal and gold Trojans T-shirt, sweatpants and slides. Carr isn't cold. He hails from the sleepy city of Fontana, about 55 miles east, where the cutting wind threatens to knock you over. Cars shake. Trash cans fly. Street lights sway. This wind doesn't bother Carr, though. He has withstood things much worse—things that could have swept him up as a child and then a teen. He chose to keep running. So fast that college coaches drooled at the way he flew downfield and then planted one foot and instantly zoomed the opposite direction. His motto was: "Slow feet don't eat." But he had more than speed. He caught balls like a receiver, he pass-protected, and he arrived at USC physically ready for battle as a 6'0", 210-pound tailback. "He's built for it; he's born for it," says Nick Matheny, Carr's former coach at Summit High. Carr broke out in USC's first four games, especially against Western Michigan, when he scored two touchdowns; against Stanford, when he rushed for 119 yards; and against Cal, when he rushed for 82 yards and had six receptions for 47 yards. He even pushed Ronald Jones II, the school's fifth-leading rusher all time. "[Stephen] definitely motivated all of us. It kept us all on edge," Jones says. "The sky's the limit with that dude." All signs pointed to Carr as the next great Trojans back. Then he felt a pop in his heel while running a route against Washington State on Sept. 29. He slightly tore his plantar fascia and missed most of the rest of the 2017 season. Then he missed all of spring camp with a herniated disk that required surgery in February. He has rehabbed hard to come back and is finally healthy. And with Jones gone to the NFL, 2018 is Carr's chance to break through. Six-year-old Carr was too small to play with his older brother, Dakari Moore, but he didn't care. He'd run on the field, and often in the wrong direction. "All he knew was he wanted to have that ball," says Shonnda McCullough, his mother. No one could catch him. Once he learned the rules of the game, he began scoring a couple of touchdowns a game, practically running people over by second grade. "I loved the adrenaline of it," Carr says. "I just wanted to keep doing it over and over again." The kid has vision, the coaches would tell Shonnda. He couldn't be pulled down, either, even later as a freshman on Summit's scout team. He ran through four varsity defensive tackles one practice. "He was unbelievable," says Mark Mercado, Summit's defensive coordinator. Carr power-cleaned 225 pounds that year without knowing proper technique. He didn't use his hips. He didn't explode up. He wasn't flexible at all. "Just total raw strength," Mercado says. Carr had to have that. His father, Stephen Sr., inspired that in him. Stephen Sr. bought his son footballs and taught him the ins and outs of the game. He prepared him for every Pop Warner game. Pop Warner was the last time Stephen Sr. saw his son play until senior year. It was Aug. 3, 2011. Carr's sister Shanelle's birthday. She was turning 17. Stephen was 12. The family liked to go all-out on birthdays, once renting a party bus to Knott's Berry Farm and once renting out a go-kart place. This was not one of those birthdays. This day began at 5 a.m. with banging on the door. Loud, long beatings against wood that felt like punches in Shonnda's stomach. She didn't have time to cry. She raced into her children's rooms to wake them up. Put on your shoes. Do as you are told. Hold on. She says a police squad of about 15 officers barricaded the street with their black-and-white cars, waking many neighbors on the block, before raiding the Carr home looking for drugs. She says they maced the family's pit bulls, Skye and Blue. The police already had Stephen's father in custody. He had been arrested the night before for conspiracy to sell marijuana. The kids didn't know that. Stephen quickly found out he was no longer a kid. Damian Alloway, Stephen's best friend since then and current UCLA receiver, remembers watching from across the street. Stephen stared straight ahead as the police handcuffed him in his front yard. His long braids spilled across his face, hiding any trace of pain. "He had that mean mug, that pit bull kind of face," Alloway says. "He was trying to look strong for his family." Stephen didn't cry. After his hands were untied, the seventh-grader held his mother and wrapped his arms around her in a cocoon. That grip would grow tighter as Stephen Sr. spent the next five years incarcerated. "The best thing for me and my siblings to do was to just be strong for my mom," Carr says. "To try and help her out and be stable for her." "You gotta have tough skin," he says, blank-faced. "I'm a person with tough skin." Don't hang out with Stephen. Don't go over to that house, some parents began to whisper to their kids. Those parents didn't know Stephen. They didn't know that he was more than quick, coordinated, electric. His smile made others smile. He prayed every day. He helped his classmates in chemistry, one of his best subjects. "Stephen didn't demand the star treatment," says Rob Peterson, a teacher at Summit. He never missed a 5 a.m. workout, even if that meant gulping down Cinnamon Toast Crunch out of a red cup while warming up. As a fifth-grader, he went all out on his California Gold Rush project, insisting Shonnda buy tiny gold chips, plastic animals and wheelbarrows from Michael's. He spent hours plastering the mountains with papier-mache, laboring to make sure each peak was immaculate. Few knew that while Stephen morphed from boy to man, from starter to national recruit, loss filled him. But he kept running through it, dragging a defender 31 yards on his back in a 2014 play that caused the announcer to howl: "He's not a Carr...he's more like a truck!" "It just made him want to work harder," says Shanelle, referring to their father's incarceration. "Stephen wanted to make his dad proud." One night, while at Almeria Park, Stephen broke down in front of Alloway. Here he was, thriving at the game his dad handed to him, and his dad couldn't see any of it. But his dad was watching. Stephen just didn't know it yet. Stephen Sr. spent those days, months, years away, scrapbooking. Shonnda sent him every newspaper article and photo of their son she could find. L.A. Times. Press-Enterprise. Daily Bulletin. Inland Empire Preps Magazine. Stephen Sr. was able to buy $7 photo albums and cut out headlines like "Star of the Show" and "Special" and "The Monster Inside," "Picture Perfect," "You Get Out What You Put In," and arrange the articles and photos inside the albums so that each was perfectly trimmed. He held the articles close to him, the ink becoming his portal to watching his son grow up. Sure, he saw Stephen on visits, but watching him play was something he could only see in dreams. Glancing at the stills of Stephen in action, he'd imagine his son bursting out of the page. "Wow," Stephen Sr. would say, reading about the way his son sent defenses into a tizzy, the awards he was racking up. He felt proud and sad at the same time. "He motivated me," Stephen Sr. says. "I had to stay strong where I was at." So did Shonnda, raising three kids and working 40-plus hours a week. She had to be everywhere and everything for everyone. She forced herself to smile but rarely felt happy. Sadness struck her hardest when she was in the stands at Stephen's game, the space empty where her husband used to sit. "Everybody thinks you're going to grow up and have this nice family and kids and it's going to be all gravy. No," Shonnda says. "You never know what you're going to have to deal with. And when it does hit you, you have to be that person that stands up and handles it." "You can't let yourself collapse," Shonnda says. "I always tell myself, 'I'm built for it. I'm tough. I have my kids. I can't let them see me sweat.'" Stephen saw that, so most of the time he kept quiet. He didn't complain. He just went to class and practice and games. "It made me want to give the world to her," Stephen says. "I don't know what I could do to repay her." He knew he could help his family by excelling at school and football. Earning a scholarship to USC was always the goal. Reggie Bush was one of his favorite players. Stephen Sr. remembered his son telling him that during Pop Warner days. Stephen Sr. beamed when the correction officers came up to him while he scrolled through his scrapbooks. "That's your boy?" they'd ask. "Yeah," Stephen Sr. said, filled with pride, filled with pain. "That's him." It was 9 p.m. one night in January 2016, the tail end of Stephen's junior year at Summit. Shonnda didn't tell the kids why she was coming home late. Then she walked in with her husband. They all hugged and cried and prayed. Stephen Sr. was finally home. For good. And just in time for football season. The first game that fall, Summit faced Etiwanda in the "Battle for the 15." Summit is east of the 15 freeway, and Etiwanda is west. Shonnda made blue and white shirts for the family, with Stephen's No. 7 on them. Stephen Sr.'s read "Football Dad" on the front; Shonnda's had "Football Mom." Stephen Sr. was so excited to watch his son, he went outside to see if anyone needed any extra tickets. This would no longer be photos or text; he would get to see the real thing live. Even though Stephen cramped up during the game, he blazed past people, scoring a touchdown to lead his team to victory. "Man!" Stephen Sr. said, turning to Shonnda, "My son be ballin'!" The two sat tightly next to each other. The feeling was both familiar and foreign. It was the first time in a while Shonnda smiled and meant it. Finally having his family together to watch him play at USC, and then having that promising season derailed by injury? That was more than disappointing for Carr, especially after proving he belonged with the upperclassmen. "The speed's there, the power's there, the strength's there. You could see it's all there," Jones says. Carr refused to mentally check out, spending hours in rehab and constantly picking Jones' brain during the 2017 season. "He works at it every day," fellow back Aca'Cedric Ware said in November. "When he's running, you really can't tell he has an injury. That's his mindset: don't show no pain, no emotion; just fight through it." Carr briefly returned with limited reps later in the season, rushing for 42 yards against Stanford to help the Trojans claim the Pac-12 championship. Even though last season was cut short, the earlier part of the campaign was special for all of the Carrs, especially Stephen Sr. He brought a basic Canon PowerShot camera to every game to take photos of his son for his scrapbooks, no longer needing mailed newspaper photos and articles. Sometimes after snapping the photo, Stephen Sr. would look back at the image he took: it was his son, racing downfield, tearing through the wind. 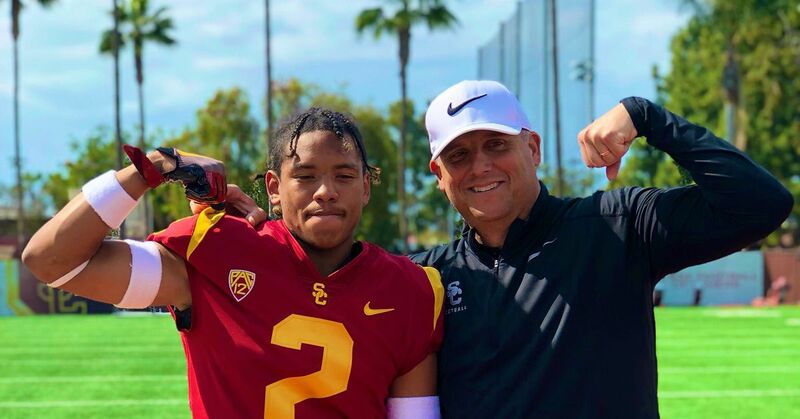 Four-star wide receiver Lavon Bunkley-Shelton, talks relationship with Clay Helton and USC history.